Sweet Pickle Designs: The heat is ON! Yes, a weird title for my post but it seemed fitting since the heat has finally arrived for our summer here in Boise! I think this is the rainiest climate or spring at least that I have ever lived in! This summer has been busy and I love all the fun projects going on! So some of these little projects I had to share with you all and do a tad of bragging about the super talented ladies I get to rub shoulders with! You guys inspire me and bring complete joy to what I do! Seeing you have as much fun creating this stuff as I do makes my job completely satisfying, so....THANK YOU!!!! First up are a few things by Karen Sanders, super talented and creative gal! 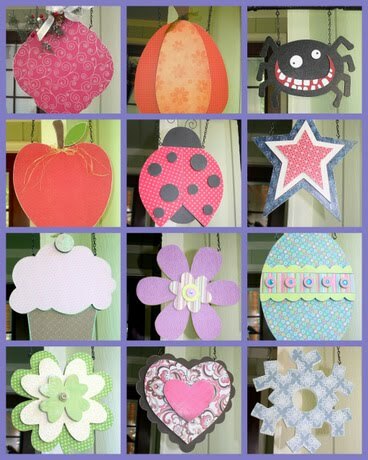 All of these were made to hang off of her Seasonal Calendar, the possibilities are endless! I just love the paper she used for this fun coffee cup! I never thought I'd have so much fun cutting out a shoe, but seriously it made me giggly, is that even a word? Too much fun! Next up are these adorable Gabriel letters done by Dawn Simpson! The font is Rustler and she decorated them in vintage Disney papers! I love it! Especially how each letter is slightly skewed, it just adds a bit more fun! Back by popular demand are the Family letters. I have had more requests for these letters than anything else I have done. I guess it's true, there's nothing more important than family, ha ha ha, yes like the laugh by John Travolta in Grease.... These papers were so fun and I was inspired by my Sis-in-law Autumn who did her little girls room in these colors. She was actually spotlighted on a blog and I'll find the link.... http://freshandvintage.typepad.com/my_weblog/2008/10/index.html Another gal needed a quick last minute banner made up for a wedding shower in Chocolates and Pinks! This was fun! Also had to show you my Father's Day tie I made for my Hubby Britt. He loves bold geometric designs and I was so bummed I ripped the paper on one side a bit and of course only glitter glue could remedy the situation. He wasn't so sure, but after my little girl Avery tried to sell him on the idea and he saw the end result he was happy. I'm thinking it would be fun to do a different pattern each year....we'll see! Happy Fathers Day! So thank you gals for sending me in some photos to share! I love seeing what you do and hope your ideas will inspire others as much as they have me!